Armstrong’s unique expertise in both iMIS and Dynamics GP brings associations and non-for-profit organizations the best of both worlds. We are dedicated to helping you get the maximum value from your technology investment. 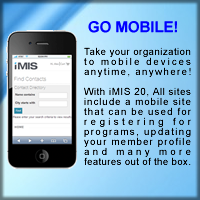 Integrating iMIS 20 in your organization or company provides a host of opportunities for engaging your members. As technologists, we understand that the success of your technology initiative will be more dependent on the implementation methodology you follow, than on any specific piece of technology you may select. You succeed using our solution-centric methodology, Armstrong Implementation Methodology - AIM. Armstrong’s experienced team of accounting and business professionals help companies gain valuable business insight from their financial systems and manage their business more efficiently. With a proven implementation program that will save you dollars and headaches, Armstrong is the best choice for your Microsoft Dynamics GP partner. The AIM process is a proven model for project implementation at Armstrong.